With over 30 years in the rider education industry U.S. Insurance has the experience and knowledge to help your school or programs. From Risk Management analysis to promptly handling and paying a claim, our knowledge and ability provides the protection your school needs. We are Members of the National Association of State Motorcycle Safety Administrators (SMSA) understanding firsthand the insurance needs of rider education schools and programs across the country. Being active in your industry for so many years has enabled us to develop and tailor insurance products to fit your needs. Whether your school is privately owned, state run or a Harley Riders Edge program, we can provide the insurance protection you need! Our expertise and knowledge of rider education training has also allowed us to develop new insurance products to answer the needs of your industry including an open road insurance program (for approved sites). So whether your school instructs students using an MSF curriculum or offers various alternative training methods we welcome your call and the opportunity to earn your business. Limits of $1 million/$2 million aggregate. Protects you and additional insured’s (training sites, designated persons) against bodily injury claims and lawsuits arising from a student injury. We offer the broadest coverage in the industry protecting you in instances where coverage would otherwise not exist. All policies automatically include EPL at no additional cost. This exclusive coverage protects all riding coaches regardless of a coach’s employment status at a school (part time, full time, independent contractor). EPL coverage protects coaches and schools for claims and lawsuits arising out of classroom injuries and accidents. Provides excess medical expenses for injuries a student sustains while in training. Provides excess medical expenses for injuries an instructor sustains while in training. Provides coverage for damage or loss to bikes with deductible options of $250, $500 or $750. Newly acquired motorcycles are automatically covered up to $7500 per unit. Provides coverage for damages to bikes while being transported by trailer from one location to another. Provides insurance for rider coach bikes during the course of training. 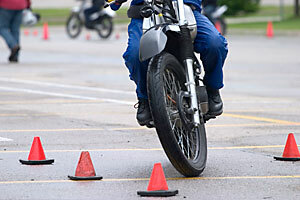 Most Motorcycle insurance policies exclude claims when a bike is used for training/business. Includes trailers, tie downs, cones and video equipment used in the classroom.